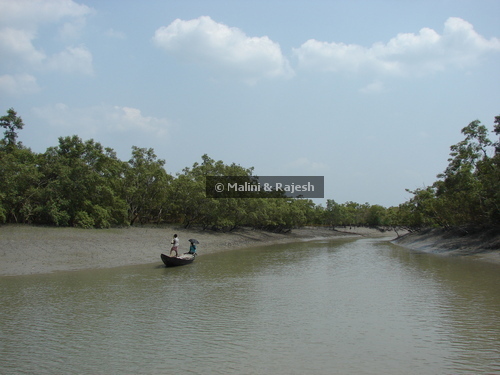 I planned to visit Sunderbans right after I read ‘The Hungry Tide’ by Amitav Ghosh. The book had everything. The sun, the sweat and a secret; the tide, the tiger and the dolphins; the romance, the research and an uprising; the black, the white and the Goddess. I wanted to see that all. Between the Bay of Bengal and the higher lands of West Bengal lies one of the largest mangrove forests and the world’s largest delta, the Sunderbans – the beautiful forest. This archipelago is made of more than 100 islands with a maze of numerous waterways and creeks, where the sea merges into the rivers. It is also a Biosphere reserve, a national park, a world heritage site and home to the Royal Bengal Tiger, not to mention estuarine crocodiles, dolphins, otters, monitor lizards, olive ridley turtles, monkeys, cheetals, boars and a variety of birds ranging from raptors like osprey, eagle and brahminy kites; waders like sandpipers, redshanks and greenshanks; smaller birds like kingfishers, flycatchers, minivets, bee eaters, woodpeckers, orioles and barbets; storks like lesser adjutants, egrets, herons and bitterns. are mostly fishermen and farmers, some are wood collectors, and during the summers when the Sunderbans is in full blossom, they are honey collectors. 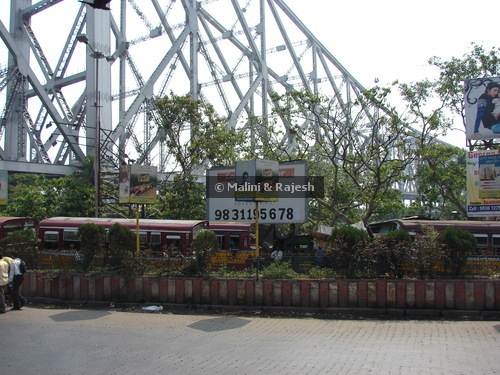 On a hot, sweaty day in the month of May 2008, we boarded a mini bus to Sunderbans from Priya Cinema in Deshapriya park in south Kolkata. It was only 8am and we were already feeling the heat. The first 30 minutes took us through some crowded city roads till we passed on to the fringes of the metropolitan city of Kolkata. For the rest of the journey we passed through some vast plains with fields interspersed with palm trees and wide canals flowing through. 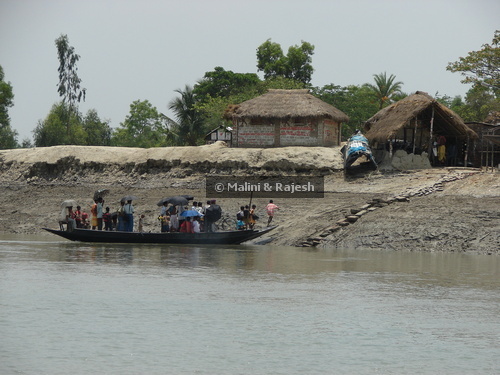 We were passing through the 24 Parganas district. 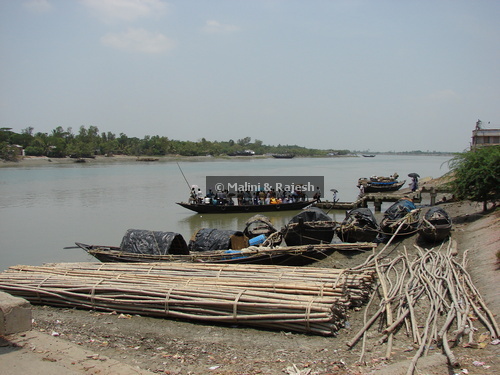 With the urban fringe of the metropolitan city of Kolkata on one side and the remote riverine villages in the Sunderbans on the other, 24 Parganas district has agriculture and pisciculture at the peak. We reached Sonakhali by 11. From there we were to take a ferry to Sajnekhali. 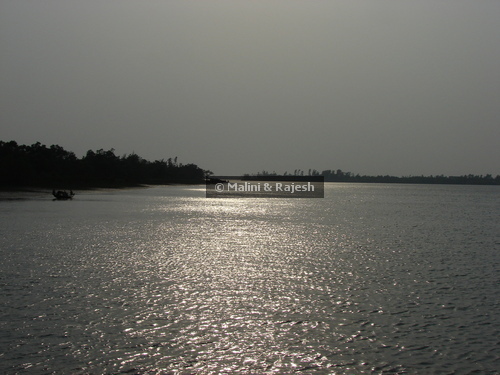 Sonakhali turned out to be a small port front overlooking a murky river. The river had all kinds of boats lined up. The boats ranged from the small oar held one-man boats mainly used for fishing, to the slightly larger country boats with hand-pulled diesel motors used to ferry people to the other side of the river or for short distances, to the larger touristy ferries with chairs fit on the decks that go down the river to the various resorts on other islands. It was rush hour when we started our trip down the river and we came across a lot of boats with school children and people going to work. The sun was already overhead and the dark greyish water was gleaming in the light. When we started our journey it was high tide, during which the water level rises as much as 15 feet. 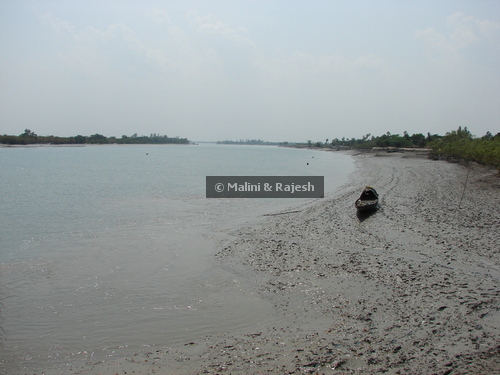 As the sea water flows into the rivers, the salinity is intense. The main rivers we were passing through were Gumdi, Gomor, Hogal, Peechlali and Bidhya. The boat is on time!!! I was expecting to see mangroves right from the beginning of the journey. But what welcomed us was a muddy river bordered with slate coloured banks. Small children were seen sliding on the clay banks while adults were seen engaged in prawn seed collection (which I learnt later) with fine nets along the river banks. The houses on the banks were mostly made of mud with thatched roofs, though there were a few concrete houses here and there. The ride was slow, and we were getting used to the rocking of the boat and the sound coming from the motor as well as the nauseating smell of diesel emanating from the engine. It had been around 2 hours since we had started our journey. We were leaving the village settlements behind and the date palms and coconut trees gave way to the mangroves. Mangroves are trees which can survive, grow and propagate in sea water or in marshy and swampy brackish water in a tidal zone. Mangroves are adapted to survive in extreme saline conditions by maintaining a suitable water balance. The roots are modified to stand firmly in the alluvial soil. Since aeration is poor in the soil, some species have evolved special aerial roots called pneumatophores. The tide was slowly receding exposing the mud surfaces, called flats, with the pneumatophores jutting out. Some of the main trees found here are Heritiera fomes, locally known as Sundari and after which Sunderbans is named, Rhizopora apiculata. Our guide said that it was the wrong time of the year to spot animals. During winters it’s a normal sight to see crocodiles basking in the sun, and tigers coming out of the cover to drink water. But still we were in full alert. 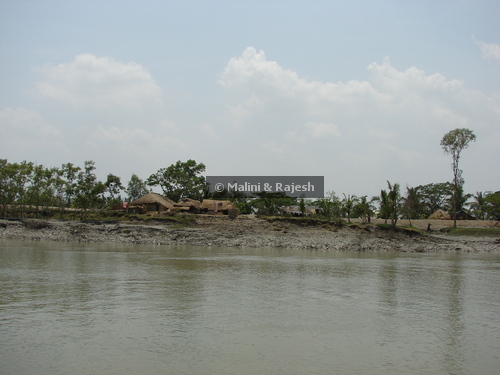 By 2pm, we reached Sunderbans Tiger Camp, situated in Dayapur, our home for the next 3 days. Tired from the heat and journey, we decided to freshen up, have lunch and then rest for a while. 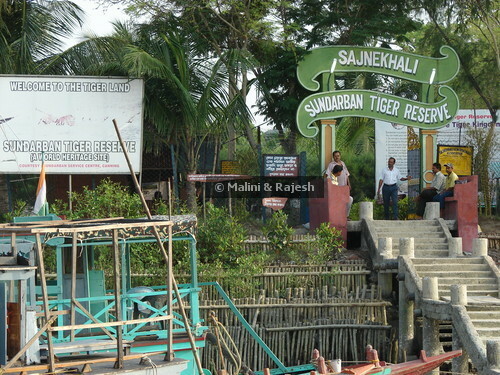 Located opposite to the Tiger Reserve Forest at Sajnekhali, the Sunderbans Tiger Camp stands on a lush green field and is totally eco friendly. 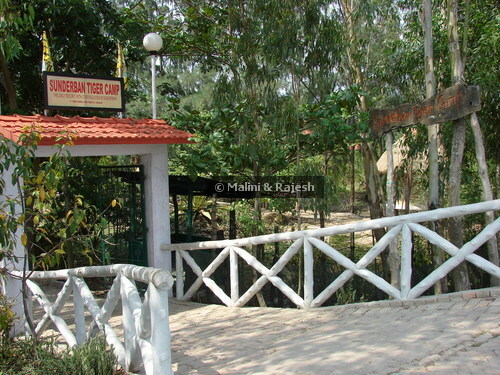 Sunderbans Tiger Camp started on 1st April 2004 as a basic camp providing 8 Swiss tented canvas accommodation with a common toilet facility and buffet meals. Later they added Cottages (A/C and non A/C) and Huts with attached baths, which only increased the grandeur of the natural environment. By 4.30 we were ready to visit the Sajnekhali Tiger reserve just a ‘shell’ throw away from our camp. Sajnekhali is supposed to be the gateway to the Tiger reserve. It has a mangrove interpretation center with a museum, an estuarine crocodile pond, a turtle pond which houses olive ridley turtles and a watch tower from where wild life can be spotted. Though we did not see any animals we saw the turtles and crocodiles in captivity. We spotted a water monitor lizard which is found in abundance in the Sunderbans. 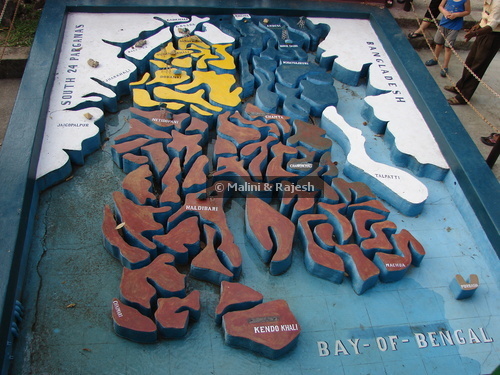 At the mangrove interpretation center they had a small model of the Sunderbans map. The museum had a collection of specimens that threw a lot of light on the flora and fauna in Sunderbans. It was getting dark and we decided to go back to the camp. The next day we were up early, got ready and watched the sunrise from the launch. We were visiting Dobanki camp. The camp has a canopy walk of about 150 m leading to a watch tower. A walk on this elevated structure gave us the feeling of walking on top of the canopy of the mangroves. There were spotted deers in plenty. There was also information about the different species of trees, animals and birds in the form of hoardings. We did spot the largest stork found in Sunderbans, the lesser adjutant stork. Later we cruised down the Matla-Sea face from where the Bay of Bengal can be seen and then we cruised back through the 5 river junction to Pitchkhali. Gangetic dolphins have made this part their home. But somehow like the other animals they remained elusive. In the evening we walked to the nearby village to take a look how they survived in this tough terrain. The village had a very clean and serene look. The roads were paved with bricks. After dinner the camp had arranged a folk dance by the locals. Most of the songs and dances were based on the legend of Bon bibi and how she saved a village boy Dukhey from the hands of the Demon king Dakkhin Rai. 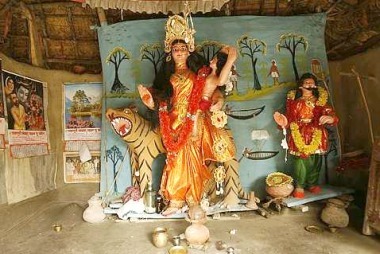 There are small temples dedicated to the goddess of the jungle, Bonbibi, in every village. Bonbibi, the lady of the forest, is worshipped by the honey collectors and wood collectors before entering the forest. Bonbibi is supposed to protect them from tiger attacks. 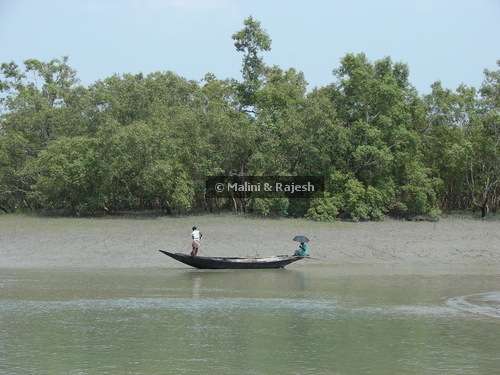 Around 150-200 people are attacked every year in Sunderbans. By 5 am, the next day, we were up and ready to visit Sudhanyakhali watch tower and cruise through the rivers and narrow creeks and the islands of the Sunderbans. At Sudhanyakhali, as the tide was low, we came across a lot of marine invertebrates like fiddler crabs and mudskippers on the flats. We climbed up the watch tower but no animals, other than some spotted deers, were found around. It was time for our journey back. We did not spot the Bengal tiger, the gangetic dolphins or even a crocodile. The only animals we spotted were,well the spotted deer. But what we learnt from this journey is that we have to appreciate the rich diversity of the flora and fauna in this area. The fact that the Sunderbans itself acts as a natural barrier and saves the people of West Bengal and Bangladesh from the various cyclones that hit that area every year. Cruising along the sanctuary itself is natures’ own never ending lesson. 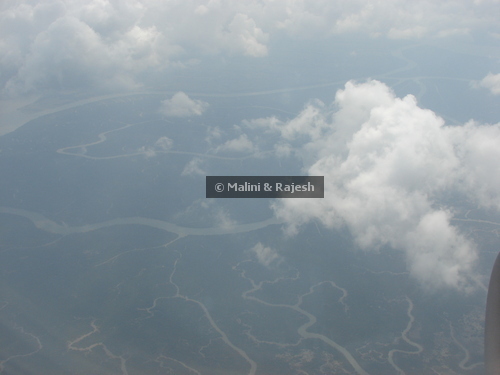 And the mangrove forests with the crisscrossing rivulets and creeks are absolutely unique to Sunderbans. I am definitely coming back here.